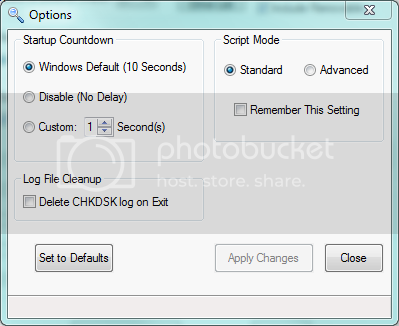 CHKDSK Assist is a GUI based script that allows you to schedule CHKDSK operations on your PC. I welcome any questions or comments about it. Thanks! Download Links -> Installer OR ZIP - Both link directly to my website for the download. CHKDSKAssist_setup.exe is the version with an installer based on Inno Setup, CHKDSKAssist.zip is a zip file with no installer. 08/28/11: v1.6.2 has been released. Release notes below. -Fixed an issue with the About dialog. -Engine upgraded to AutoHotkey_L v1.1.03.00. -Removed the Options GUI status message text boxes, which have been replaced by the status bar. -Installer upgraded to TR Tools Setup v2.8.1. -Made a minor behavior change to the Check for Updates code. -Added compatibility fixes for newer AutoHotkey engine versions to the Check for Updates code. -Includes v4 Revision 1.0.0 of the CHKDSK Assist Manual. The help file has been migrated from Helpinator v2.x FREE to v3.5 FREE. Please Note: Upgrades from v1.4.1 or older are not supported due to the changes made to the installer. You must uninstall that version before installing the latest one. looks very interesting. i will have to give it a whirl! Thank you both for trying it out, I hope you like it. v1.2.0 has been released. Check out the first post for details. let us know if you'd like some webspace on a dcmembers.com account. I just discovered a particularly annoying bug with v1.2.0. I've posted v1.2.1, which fixes the bug. Hmm...I think I might like that! OMG this awesome! I've been looking for this kind of TOOL! Very cool -- i just put it on the blog (and added it to the Coding Snacks page). Just giving this useful script a modest bump. Thanks for this, it's a great improvement over the meaningless progress bar that accompanies the default Windows control for CHKDSK. Most useful program I have on my PC next to Process Explorer. Thank you very much! What about a for darklight_tr? Thanks for the kind words. Its very nice to hear when someone appreciates your work. Thanks a ton! I should send you more credits for not choosing a mouser-esque name such as "Check disk+spell and find robot"
Third time, I got a beer & manually entered chkdsk c: /f /r & sat in front of the computer - it checked everything, showed the results for about 1/100th of a second.So I went back to your app & checked the log again to see the same message again. 30716248 KB total disk space. 12933644 KB in 59166 files. 36840 KB in 7361 indexes. 137260 KB in use by the system. 17608504 KB available on disk. 7679062 total allocation units on disk. 4402126 allocation units available on disk. unfortunately in my case I had an error report for the Dr.Watson debugger last year - MS's 'solution' was to disable it - http://support.microsoft.com/kb/949820 (I remember at the time it was seizing up and created a multi GB log file). Sorry for my late reply...I haven't checked this post too much lately. From what you posted, everything is working fine. The log file only logs what is output when CHKDSK Assist sends its command to cmd.exe. 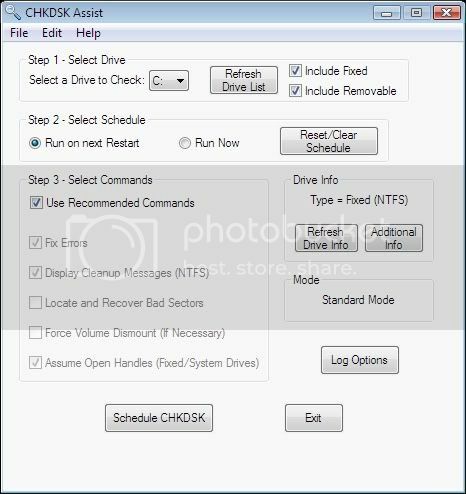 If you need to reboot first (required if you are checking the drive with the Windows install on it) you will see exactly what you posted in the log file. I should probably make this more clear, and will do so in the documentation in the next release. I'll also look into pulling the info from the Event Viewer into the script itself or at least adding a link so you can get to it quickly.